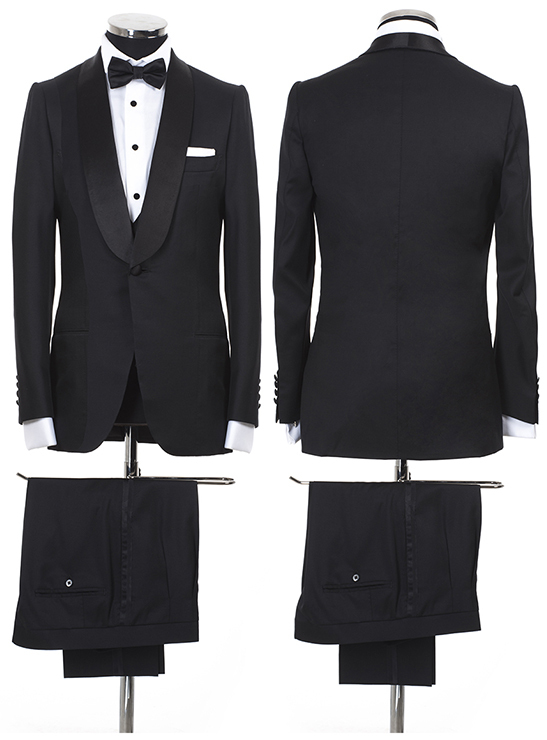 The classical dinner suit, the perfect match for a stylish evening dinner. This classical tuxedo in realized in 100% mohair wool. The jacket has the classical shawl collar in silk. The pants are made in mohair as well, but refined with silk braids and belt with adjustable buckles on the sides. The shirt is classical, made in silk or cotton, with embroidered double button hole-cuffs for your cufflinks. Jacket: 100% mohair, one botton, shawl collar. Pants: 100% mohair, no belt, classical pockets, side braids in silk. Shirt: 100% cotton, classical cut, no pocket, black button.